Commemorated on 14 September, is the Feast of the Triumph of the Cross. On this day, the Church celebrates both the discovery and the recovery of the True Cross of Jesus Christ. Mary of the Cross, how apt your title! Walking in faith, following Jesus. You learned the immeasurable love of God. Poured out on those who maligned you. To depend entirely on the God who takes care of us all. In His Presence, His love and compassion. So too you forgave those who tortured you. On that loving God who takes care of us. All that is good in our world. Hear our prayer for all that needs redemption. Carry with us the yoke we are invited to bear. Draw us ever closer to our loving God. Sr Mary Jo Wells, a Sister of Saint Joseph from Perth, Western Australia, died peacefully at the end of 2017 after a short illness. She had been writing poetry for many years and produced a number of private books of poems. Sr Mary Jo’s writing reflected her deep relationship with God and her call to Josephite life. 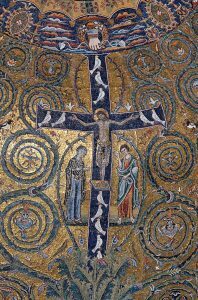 Image: Triumph of the Cross. Detail from the apsis mosaic from Basilica San Clemente in Rome, 12th century. Obtained from Wikimedia Commons. Used with permission.